348 pages | 92 B/W Illus. Covering theory, algorithms, and methodologies, as well as data mining technologies, Data Mining for Bioinformatics provides a comprehensive discussion of data-intensive computations used in data mining with applications in bioinformatics. It supplies a broad, yet in-depth, overview of the application domains of data mining for bioinformatics to help readers from both biology and computer science backgrounds gain an enhanced understanding of this cross-disciplinary field. 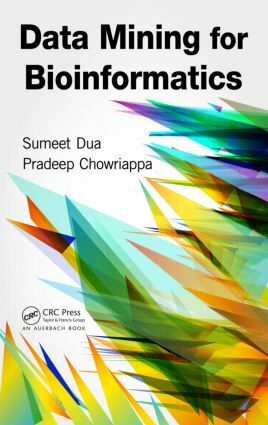 The book describes the various biological databases prominently referred to in bioinformatics and includes a detailed list of the applications of advanced clustering algorithms used in bioinformatics. Highlighting the challenges encountered during the application of classification on biological databases, it considers systems of both single and ensemble classifiers and shares effort-saving tips for model selection and performance estimation strategies. Sumeet Dua is an Upchurch endowed professor of computer science and interim director of computer science, electrical engineering, and electrical engineering technology in the College of Engineering and Science at Louisiana Tech University. He obtained his PhD in computer science from Louisiana State University in 2002. He has coauthored/edited 3 books, has published over 50 research papers in leading journals and conferences, and has advised over 22 graduate thesis and dissertations in the areas of data mining, knowledge discovery, and computational learning in high-dimensional datasets. NIH, NSF, AFRL, AFOSR, NASA, and LA-BOR have supported his research. He frequently serves as a panelist for the NSF and NIH (over 17 panels) and has presented over 25 keynotes, invited talks, and workshops at international conferences and educational institutions. He has also served as the overall program chair for three international conferences and as a chair for multiple conference tracks in the areas of data mining applications and information intelligence. He is a senior member of the IEEE and the ACM. His research interests include information discovery in heterogeneous and distributed datasets, semisupervised learning, content-based feature extraction and modeling, and pattern tracking. Pradeep Chowriappa is a research assistant professor in the College of Engineering and Science at Louisiana Tech University. His research focuses on the application of data mining algorithms and frameworks on biological and clinical data. Before obtaining his PhD in computer analysis and modeling from Louisiana Tech University in 2008, he pursued a yearlong internship at the Indian Space Research Organization (ISRO), Bangalore, India. He received his masters in computer applications from the University of Madras, Chennai, India, in 2003 and his bachelor’s in science and engineering from Loyola Academy, Secunderabad, India, in 2000. His research interests include design and analysis of algorithms for knowledge discovery and modeling in high-dimensional data domains in computational biology, distributed data mining, and domain integration.